It’s something we often take for granted but eating out and looking at a menu wondering what on earth you’re going to eat can be quite the hurdle for those who have impaired vision. 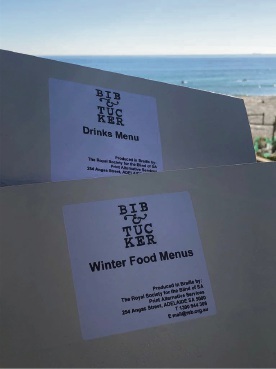 So we’re changing the game here at Bib & Tucker and ensuring the menu browsing experience is one all can enjoy by providing Braille menus from June so that everyone is invited to the table. Supporting us with this initiative is Vision Australia – the leading national provider of blindness and low vision services in Australia. Vision Australia Perth’s Regional Business Manager Donna Fahie says social inclusion is key to Vision Australia’s mission to ensure people who are blind or have low vision can live the life they choose. “Many people find it difficult to get out there and try something new, but people who are blind or have low vision in particular face many barriers,” she said. Our new braille menus will be available from June 2018 at both Bib & Tucker and May Street Larder.